Snails have invaded some local areas throughout northern Santa Rosa and Escambia Counties this summer. 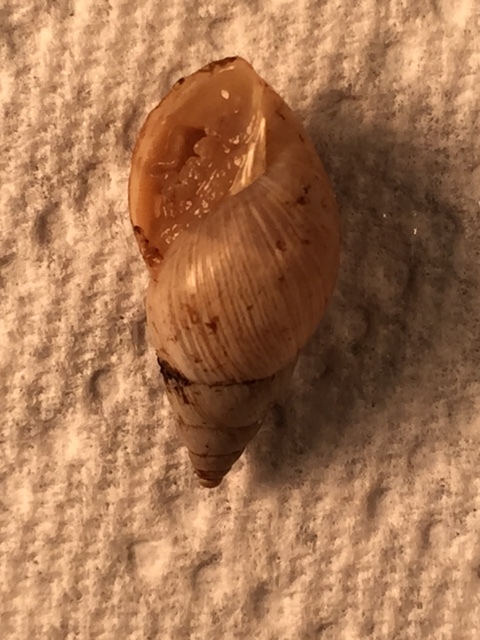 The snails are tan colored, high and conical, with mature snails about ¾ to 1-inch long. They have been found in extremely high numbers in some crop fields, including corn, cotton, and peanuts, in home gardens, and around farm buildings adjacent to fields. We first started seeing large numbers of these snails two years ago and they were identified as Bulimulus sporadicus, an introduced species from the West Indies. These snails were first reported in Florida in the Jacksonville area in 2009, mainly around railroad tracks. Since then populations have been reported in other parts of the state including Hillsborough, Nassau, Putnam, Clay, Bay, Polk, and Seminole Counties. 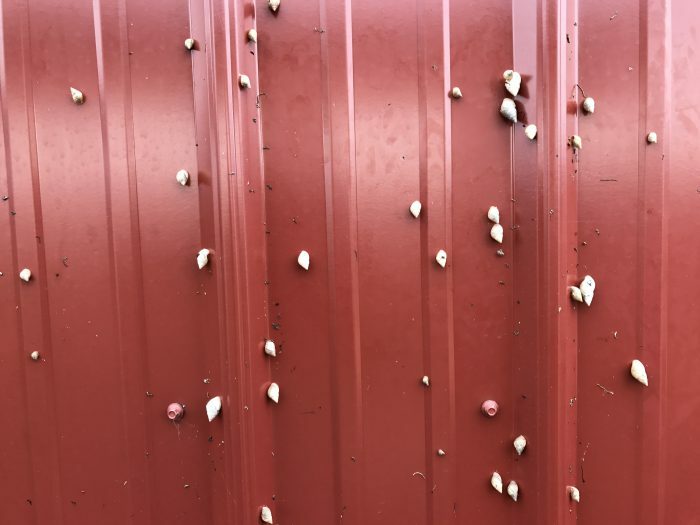 Other southeastern states, including Alabama, Georgia, and Mississippi have reported similar snail infestations in recent years. 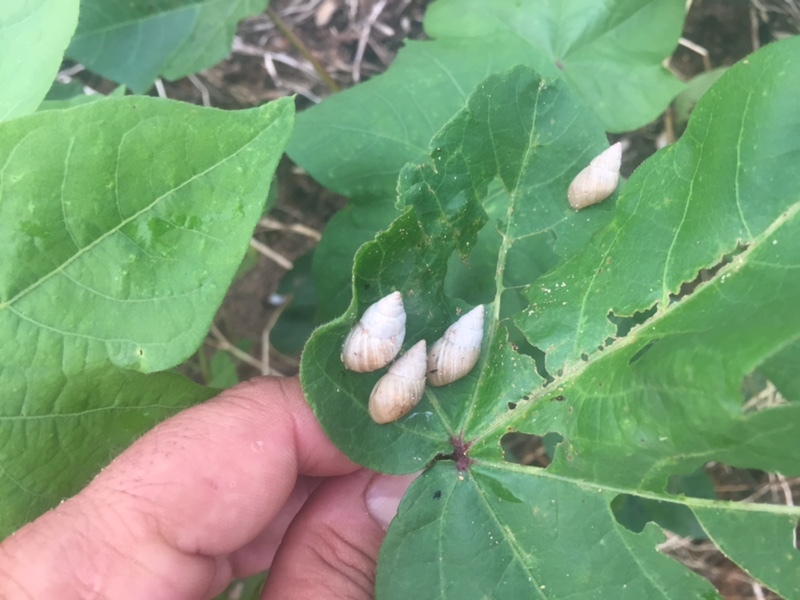 Pictures from a soybean field last year posted on the Lowndes County, Georgia, Extension blog appear to show the same species. As far as we can tell, they are not chewing plant parts or causing damage like slugs. 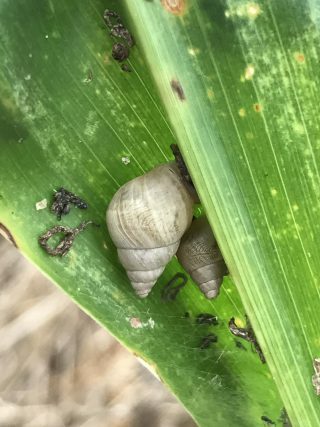 However, a heavy infestation found recently on volunteer corn appears to be sucking plant juices causing the plants to decline. In many cases it appears they are feeding on decaying vegetation, especially in minimum tillage situations. To our knowledge there is not an economical chemical control for use in row crops. 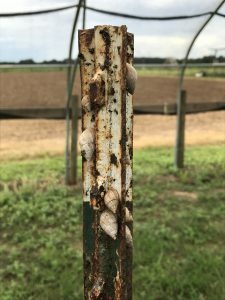 In 2005, Extension specialists in Mississippi conducted several studies looking at control options for snails and slugs with limited success. Insecticides simply did not work. Snails and slugs are favored by high humidity and wet conditions, which we have certainly had this year. In a home landscape situation, the elimination of mulch, ground cover, or other areas that hold moisture may provide cultural control. Specially formulated molluscicide baits are available, but we do not know of research showing their effectiveness on this species. Metaldehyde-containing baits have long been available. However, they are quite toxic to pets and wildlife, so care must be exercised if this toxicant is applied. Alternatives to metaldehyde include products containing iron phosphate or boric acid. Iron phosphate is much safer than metaldehyde for use around pets and vertebrate wildlife. Boric acid, while also safer than metaldehyde, seems to be much less effective than iron phosphate. 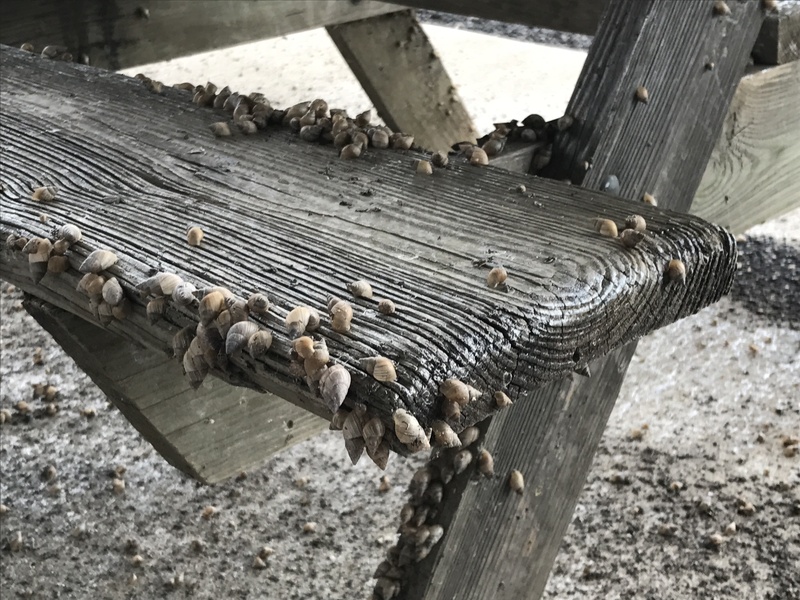 Snails on a picnic table. Layton, Blake. Control Insect Pests in and around the Home Lawn. Mississippi State University Extension Publication 2331. Michael Donahoe is the County Extension Director in Santa Rosa County. His educational program focuses on agronomic crop production with primarly responsibilities in integrated pest management and cotton production.